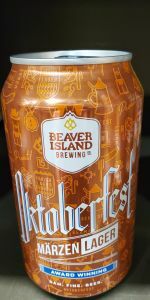 Home Beers Beaver Island Brewing Co.
Oktoberfest Marzen Lager | Beaver Island Brewing Co.
As the first hints of Autumn descend upon us, it is a perfect time to reflect on a great summer and celebrate the upcoming harvest. Our traditional Oktoberfest is one of the most authentic Marzen style lagers available on this side of the pond. A careful blend of Imported German Malts and hops along with a long cold aging process result in a perfectly balanced brew. Prost! Thanks to Victory_Sabre for this one, from a side-box during NBS BIF#8. 16oz can poured into 14oz teku. Poured a clean and clear dark copper color with 1/4 inch of khaki head that had low retention and no lacing. The aroma was lead by gently sweet malts, with some floral and earthy hops in the background. Same on the palate, sweet malts supporting light hops. The body was a touch fuller than I've found to be typical, but it worked in favor of the beer, made it more of a sipper instead of a gulper. A finish that was only semi-sweet rounded things off nicely. Drinkability was very good, my can was gone quickly. Overall, a very nice take on the style, certainly worth trying if you see it. A little aqueous in the aroma with a backing of soft rich malt. Pretty simple and fine. Very orange/brown and very clear. Off-white to tan colored head. Nice little sparkle on the tip of tongue. Decent drying on the finish. A little more hops than many. Really quite blended that way. Strong herbal and grass qualities. Cuts the richness some. Body is less than moderate. Appropriate carbonation at lager level. Drying seems to grow. More hoppy in taste and dryer than many. Pretty clean. A fine example. Dark amber clarity and nice clean lager finish. The noble hops play more of a role than in the German imports no surprisingly. Good all around drinker that one wants to consume in mass quantities. This beer pours a clear copper with with a solid head. The aroma is bright and zest, with notes of lemon peel and white pepper, and slightly corn bread like malts. The flavor is semi sweet, with toffee malts, a hint of citrus peel, and a crisp, dry finish. The mouthfeel is medium bodied with bright carbonation. Overall this is a nice, solid example of the style, tending toward the lighter and more drinkable type. Poured a clear, light brown color with ruby highlights and a small, tan head of foam. It smelled caramel and toffee. Some floral notes. Sweet caramel flavor with a touch of bitter hop bite. Poured from 16oz can into glass. Can notes: "THIS AUTHENTIC MARZEN TRANSFORMS GERMAN MALTS AND HOPS INTO A RICH, BALANCED LAGER. PAIRS PERFECTLY WITH LEDERHOSEN." AND "THE AUTHENTIC GERMAN MARZEN. PERFECTLY BALANCED & AGED." The can is colored close to the color of the beer. Dark copper color body, slightly off white head settles into interrupted cap. Minimal lacing. Smell is a little faint. Toasted bread, Noble hops. Taste is full and balanced. Malt forward with touch of caramel. Rich and complex. Sweetness at the end. Feel is medium full and fresh. An award winning Minnesota brewed Oktoberfest. Prost! (as noted on the can). This pours a clear brown color. The head was white, one finger, but the head retention was very poor when poured from the can. The nose is somewhat sweet smelling. I think I get a slight nutty aroma. Some malts also. The taste is crisp, maltiness, smooth, slight bitterness on the backside. Overall, not a bad Oktoberfest, but I've had better. T-Toasted maltiness but nice depth to the malt flavors...malty but clean. O-Excellent Oktoberfest beer. One of the best I've had. Spot on for style too. I'm going to be buying a lot of this. Beaver Island is very quietly putting out some outstanding lagers.. Their Maibock is also fantastic. Their Ripple, while not a lager, is also a fantastic beer along those lines. Oktoberfest Marzen Lager from Beaver Island Brewing Co.